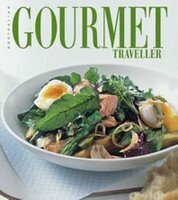 Australian food bloggers get a bite of the glossy magazine action in the latest issue of Australian Gourmet Traveller. Journalist and fellow food blogger Ed Charles from Tomato has written a long overdue article on the Australian food blogging scene, giving some much deserved exposure to our own Aussie-based burgeoning talent. The two page spread includes a lovely glossy photo of the hardworking Melbourne folk behind Sarah Discovers How to Eat, A Few of My Favourite Things, The Breakfast Blog and Ed himself. Within the article are mentions of spiceblog, heralded as Australia's first food blog (officially Old Spice now? ), The Food Palate, Australian Gourmet Pages and Cat on the Bench. And just to prove Australians are not completely insular, Ed includes Guam-based The Scent of Green Bananas, and the ominpresent Chez Pim too. "keep a hectic schedule of suburban restaurant reviews and local food and cultural festivals". That's so much nicer than just calling me perpetually greedy. To those who have dropped by this site via Australian Gourmet Traveller: Hi! And welcome! Hungry? Congrats on the mention - you're the best local food blog! Hi foodcrazee - lol. Good work! Hi Julia - Aww shucks, thanks. Hi Sue - Cheers. One for Mum to show the rello's eh!